The blogger applications are now closed. Thank you for your interest. Blogging the event is optional on BOTH sides. That means we are not going to set rules about who blogs what, when, and for how many cookies. That said, we also do not force merchants to provide review packs, either. They can if they want to, and if not, that’s fine too. We ask that both sides be respectful, and that’s pretty much it. For blog-writing purposes it’s good to note that the merchants are not required to provide exclusives or reserved items for the Spiral, simply either one 100% charity donation vendor or two 50% charity donation vendors. Exclusivity is completely up to each merchant. We will allow access to the event several days early for bloggers to run around and do their thing. However, there are no artificial setup deadlines for the merchants beyond the opening time: no merchant is required to be set up and ready earlier than the actual opening of the Spiral. The early access to the area is mostly for the purpose of sim photography teasers, although it’s also simply because the bloggers are a part of the team and the team is welcome to visit the area as much as they wish. 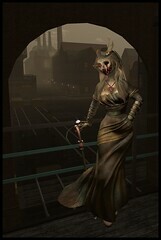 As for the event itself, the theme is steampunk, steamgoth, dieselpunk, dieselgoth and dark Victoriana. The time is September 15th – October 1st, 2014. The charity is National Kidney Foundation. You can read more about the event here. If you are accepted, you will be invited to the Cursed Events group and will need a free group slot for it. If you have blogged for us before and are still in the group, please send in an application anyway. The group will be cleaned from the bloggers that are not chosen for this event before the early access begins. If this happens, you are still welcome to apply to future Cursed Events just like anyone else: our themes and blogger-amount needs vary per event. No hard feelings and nothing personal. We love our bloggers the absolute most when they are inspired by the event, when they have the time and energy to have fun with the theme, when they genuinely enjoy the blogging. RL happens, interests vary, blogging inspiration waxes and wanes. We understand this. Even if you are one of our regular bloggers, there is never any obligation to apply to all of our events: it is perfectly fine to take a break and return to another event when your life works out for blogging. If you have any blogging related questions or comments, please IM Sonya Marmurek. If you IM any of the other organizers, they will just send you to Sonya, so skipping that extra route spares some time for everybody. We do not guarantee that everyone who applies will be accepted. Only the accepted bloggers will be contacted.